The next stage for beginners where you learn to make four ‘different’ 12” finished blocks with sashing strips and setting squares and one border. 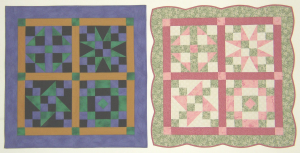 Each block takes you through cutting and sewing different shapes, such as rectangles, squares, half square triangles and a square in a square. If you are a ‘seasoned’ quilter, I have included a template for the scalloped edge with full direction on how to attach the bias binding.